Testimonial written by an Ulverston client aged 52 who had previously severe chronic neck and lower back pain. Have you suffered any Injuries? foot while climbing in Patagonia last year. I was about 800ft up and my foot slipped and I took a massive fall and hit a ledge on the way down". Other than rest, what did you do to get over it? "At Ulverston Natural Health Centre I used a device called Scenar, the Russians spent millions researching it for cosmonauts because you can’t take drugs in space. It was very effective". 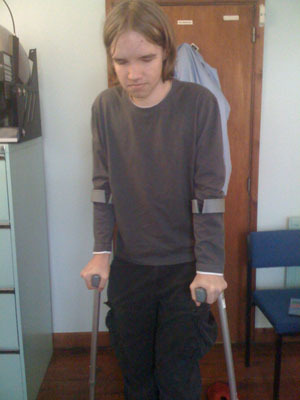 A client : "On crutches before my Scenar treatment therapy". "Walking pain free after treatment"
'I have been a patient of Roy Watkins’ for a number of years now and have been having treatment at the Ulverston Natural Health Centre Clinic over the past few months to help me recover from a major operation. 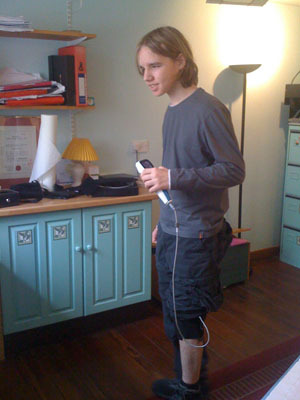 Roy has been using the Scenar to aid my recovery and to help my body heal itself from the trauma of the operation. Latterly I have been receiving treatment on my face which has increased blood flow and made my skin glow with good health as well as helping to reduce the lines, wrinkles etc. The treatment is pain free and very relaxing; in fact I nearly fall asleep every time I have the treatment '! "I have no hesitation in recommending this form of treatment to anyone who has undergone major surgery as the overall general effects include pain relief; it provides a great sense of well being due to the increased energy in the body as well as a more relaxed overall state of mind ". "When I looked in the mirror I could hardly believe it was me - the tone of my skin had changed, my cheeks had more colour and my face somehow seemed more alive... Moreover, the treatment had an immediate and noticeable impact on the length and quality of my sleep - which has improved immeasurably and which in turn has given me a real energy boost during the day."